THEY say love happens quite unexpectedly. You accidentally stumble across that one person, and before you even realise what’s happened, you’ve fallen for them. The story of Géraldine and her dance-instructor husband, Praveen, is no different. After studying Travel and Tourism in Rouen, France, a young Géraldine was eager to explore the world, her trusty camera in hand. 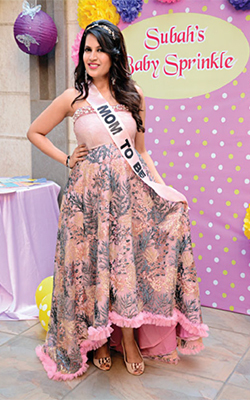 She found herself moving to the United States and Australia before making her way to India in 2010. Quite unexpectedly, she fell in love with India and has lived here ever since. What cemented her decision to make this move permanent was meeting her husband at a Salsa dance party that was incidentally, hosted by her brother-inlaw. Of course, her adventures didn’t die down, particularly after she landed a job with Royal Enfi eld and biked her way around the country, committing her travels to memory in the form of photographs. However, in 2014 when Praveen and Géraldine decided to make their relationship official, she decided it was time that travel took a back seat. Marriage is a lifetime commitment, and it usually takes a lot of hard work, compromise and understanding to make it a success. For Géraldine and Praveen, the decision to have a wedding which celebrated both cultures was undisputed by family and friends. “We’re both very attached to our origins, so our wedding was a mix of French and Indian traditions. Since I’m not religious and don’t practice any faith, we chose to exchange vows a little differently. 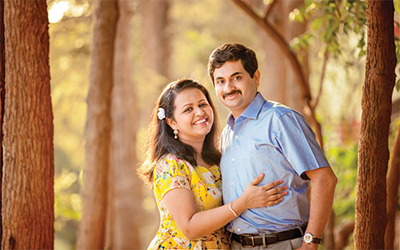 Praveen is a Hindu, but his faith hasn’t really had any negative impact on our marital bliss. In fact, I quite love the happy spirit, colour and joyfulness of it,” says Géraldine. And from then on, life couldn’t get better. The newlyweds had a blissful honeymoon period and when it was time to get back to the real world, they were a little reluctant. However, life happens and they soon threw themselves back into work—Géraldine pursued photography and Praveen went back to dance instruction. Soon, Géraldine realised that she wanted to pursue photography fulltime, and opened her very own studio out of her home in New Delhi called Géraldine Sandhilya Photography. It was then that she began her newest adventure, specialising in maternity, newborn and child photography. Watching mums with their babies on a daily basis, made Géraldine feel like, perhaps, there was something missing from her otherwise-perfect life. However, when she realised she was late, she got a little nervous. “I had my reasons to believe that I might be pregnant but when I found out that I was not, I was very disappointed,” she admits. That’s perhaps the moment she realised she was ready to start a family. “Since Praveen is eight years older than I am, he was ready for a baby long before I was. So, when I told him I was ready to try for one, he was excited. I’m glad I didn’t have to convince him one bit,” she tells us, excitedly. After that, life couldn’t get better for the happy couple. They began trying and enjoyed their jobs tremendously, in the mean time. However, about five weeks into her pregnancy, Géraldine realised she was expecting. 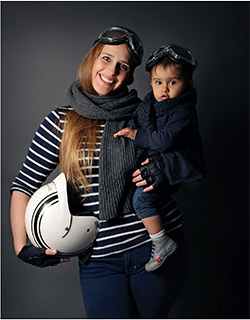 “I was so engrossed in work that I didn’t realise I was going to become a mother, until I was five weeks pregnant! When I told Praveen that we were going to be parents, his reaction was rather lukewarm. I was a little taken aback with his reaction because I expected a little more enthusiasm from him, but he didn’t show any emotion,” recalls Géraldine. When the couple finally got back to India, and they went for their first ultrasound, Praveen became a whole new person. “I think he was in shock and didn’t believe the news till we went for our first check-up. After he heard our baby’s heartbeat, his face lit up! I have never seen him so happy,” she says with a smile. For Géraldine, the cultural gap began to show during the time she was expecting, something that added to her already difficult trimester. She experienced a severe bout of morning sickness during her fi rst trimester, and kept herself busy to avoid thinking about the nausea. “Praveen, of course, encouraged me to stay home more, and relax. He didn’t understand my need to keep busy! He was extremely supportive and nurturing, but he didn’t realise I needed to work and stay active,” says Géraldine. That’s when the tension began to creep in. “It is not in my nature to be inactive. Moreover, I believe that pregnancy is not a disability or sickness. In Europe, doctors encourage pregnant women to stay active and behave normal. Of course, only a few things are not recommended, like carrying very heavy bags, or adventure sports like parachuting, skiing, or motorbiking. In fact, everything is permitted. You’re encouraged to do everything you’d normally do, and doctors even recommend a bit of exercise and physical activity till you reach full-term,” she says. But, the disagreements all seems trivial in the light of the bigger picture— Praveen and Géraldine were soon going to be parents, and nothing could really dampen their spirits. Moreover, Géraldine felt completely cared for, and loved by Praveen and the rest of the family. “After I decided that they only meant well, I didn’t really let the disagreements bother me. I knew my body best, and I did heed a little of their advice, if not all. But Praveen was incredible throughout. He’d give me massages when my feet or back would ache; he took me out a lot because he knew how much I loved to travel. He even encouraged me to pay my family a visit! I really couldn’t have been happier,” she says. Before long, Géraldine had established a healthy routine. She read as much as she could and even enrolled in birthing classes to help her prepare for her delivery. “I didn’t know what to expect, so I tried to prepare myself mentally and physically for everything. I even had a doula that would come home before Leonie was born, to help me with some exercises which I could do at the time of delivery. Apart from this, I followed Baby Centre notifi cations regarding the evolution of my pregnancy,” she says. EVER since 28-year-old Subah married the love of her life, Arpit, five years ago, her life has been a dream. 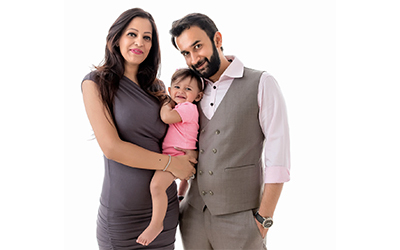 Having married at a young age, Subah and Arpit have spent a great deal of time together, enjoy their married life, and getting to know each other before going the family way. “I believe that it’s important to spend quality time with your partner, because after you start a family, what I’ve noticed is that most couples lose themselves in the midst of raising children. When we married, I was 23 and Arpit was 25. This meant we had plenty of time together to enjoy our marriage before we could plan for a child,” says Subah. It wasn’t until after being married for five years that Subah felt she was ready to start a family. She was certain that Arpit would make a great father, especially after watching just how well he had cared for her these past few years. “We were too young to have a baby when we first married. We were practically kids ourselves. But as time passed, and we knew exactly what to expect of each other, we both decided it was time. After all, we wanted to be young parents. This way, we’d be able to keep up with our kids as they grew up. I know it can get quite tiresome, so we would need all the energy we could get,” she jokes. When they both decided they were ready, Subah and Arpit began planning to conceive. “We were honestly surprised when we got pregnant because we didn’t expect to be successful after the first try. We figured we would have a little more time to prepare the house, and do everything necessary before we got pregnant, but we were ecstatic with the news and looked at it as a blessing. Besides, it made us take charge and prepare ourselves,” says Subah. After the couple got pregnant, Subah saw a whole new side to her husband, something that made her appreciate having him in her life. “Arpit was an angel all throughout. For the entire time I was pregnant, he pampered me and gave me only the best. He took such incredible care of me that even if I had to sneeze, he’d worry that it was something serious. If I was restless in the nights, he’d be up with me, comforting me. When I experienced morning sickness during my fi rst trimester, Arpit was by my side holding me. He even went to such lengths as to instruct his family and hired help to be at my every beck and call. It was adorable. 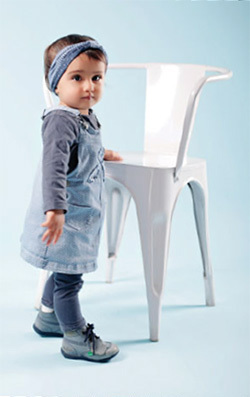 I really couldn’t ask for more,” Subah recalls with a broad smile. RELATIONSHIPS are all about striking a balance and for parents Priya and Rajat Kochhar, there couldn’t be a more supportive and balanced dynamic they could have imagined. Their marriage is the perfect harmony of two individual personalities that absolutely shine through in each other. “Everyone calls us ‘the power couple’, and we totally believe it! I would like to believe that Rajat’s dynamism and my vivaciousness, somehow manage to create an impact on people everywhere we go,” she admits. In fact, it was these very personalities that made them fall for each other. “Rajat and I met in the mountains of Himachal, where I hail from. When we first met, he was there to set up a factory for his family business. Fate chose to bring us together, and right from the start, we got along famously. After a year of dating, our families met and and decided to get us married,” she gushes. 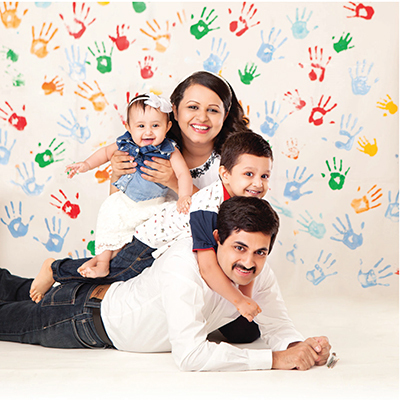 When it came to starting a family, Priya was fortunate that Rajat had the same idea. “One day, Rajat said to me, ‘Let’s have a baby’ and I said, ‘Yes, let’s’. It was as simple as that. Usually in most marriages, it takes a lot of convincing when only one partner is ready to have a child. Usually, the husband is not ready and the wife has to explain and coax him into agreeing. And this is not an easy topic to convince anyone on; it could take months or even years before one of them relents. Thankfully, this was not the case with us and we both were on the same page at the same time,” she says with a broad smile. 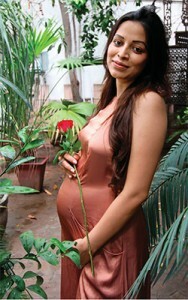 Priya, being the fit and active person she is, had an absolutely smooth pregnancy. “My pregnancy was a breeze. This was my first pregnancy, and I have to admit I was nervous because I didn’t know what to expect. I had only heard stories of crazy nausea, vomiting, hospitalisation, water retention, swelling, back pain and what not! So I was expecting, at the very least, to experience some of it, if not all. I was a bit surprised when my pregnancy kept progressing without the appearance of any of these symptoms,” she says. If that was only all, Priya was clearly one of the lucky few to only carry in her belly. “I only gained weight in my belly and hardly on any other part of my body. My belly was also unusually tiny. In fact, at my baby shower, my friends and family had to do a double take, just to make sure I was really carrying. Over the nine months of my pregnancy, I gained a healthy weight of nine kilos. I am glad that my routine and healthy habits helped me stay fit,” she says. As a way to stay active, Priya enrolled in some pregnancy fitness classes, and thoroughly enjoyed every moment there. “I joined Antenatal Yoga and fitness class which by far was the best thing I would say about my pregnancy. It was called Zaazen Wellness and is a part of Phoenix Hospital itself. The classes taught me that pregnancy is not only about resting and pigging out. It’s also important to stay active and fit, for the health and well-being of you and your baby. I was always bursting with energy,” she says. For Priya, the nine months she carried Taarini was perhaps one of the most wonderful experiences for her. She was healthy, happy and couldn’t ask for more. When it was time for Taarini to be born, Priya figured childbirth would also be as smooth as her pregnancy. Well, life is funny and she was in for a surprise. 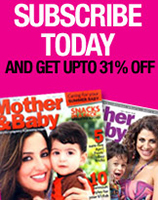 “I was in my 41st week of pregnancy with no signs of going into labour. I figured that after completing the full term, Taarini would be ready to greet us. When I passed my due date, my family began to get anxious and we opted to induce labour. I was in active labour for three days but still wasn’t dilating enough. We even burst the water bag, but Taarini just wasn’t ready to come out. At the end of the third day we took a call to opt for a C-section because we didn’t want to distress the baby. So at 11 p.m that night, I was wheeled into the delivery room, and 20 minutes later, we welcome our beautiful baby girl,” she recalls. H AILING from a small town, Khushboo never imagined that one day she’d move to Mumbai to try and break into showbiz. Born and raised in the beautiful city of Chandigarh, she comes from a long line of successful doctors; her parents even ran a thriving private nursing home. “I sometimes think of myself as the black sheep of my family. My mother is a gynaecologist, my father an anaesthetist, my sister is a dentist, sister-in-law a clinical psychologist, and brother-in-law an orthopaedic surgeon. Every member of my family is connected to medicine,” she says. However, with a rather happy-go-lucky mindset, Khushboo never felt forced to follow in their footsteps. FOR 38-year-old Durba, a true Bengali, settling down in the chaotic city of Mumbai was something she never thought she’d do. Of course, life doesn’t always go as planned, and Durba found herself making a home in Mumbai after she met her husband Rabin through an arranged marriage set-up. “I’m from Kolkata and I’ve always found Mumbai to have a rather ‘professional’ approach to everything. That’s definitely not a good thing. When I compare Mumbai to Kolkata, I see the differences. People in Kolkata are approachable, friendly and welcoming. In Mumbai, people barely have time for themselves, let alone for anybody else,” she says. However, after living in this city for over eight years, Durba has come to love the differences, and appreciates Mumbai for what it is. After their marriage, Rabin and Durba decided to wait a while before starting a family. They wanted to spend quality time together, strengthen their relationship, get to know each other and concentrate on their careers before introducing a new member to their family. 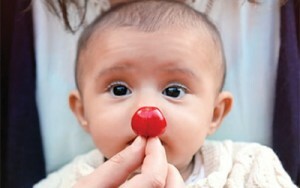 After three years of married life, the couple began planning for a baby. “My husband was apprehensive in the start and would skedaddle when anything to do with ‘responsibility’ would come on his shoulders. He soon came around though,” she says. Durba further adds, “We knew our age would be a major hiccup when it came to successfully getting pregnant, but we were already hard-pressed for time. If that’s not all, stress and everyday life served as another block when it came to trying to conceive.” Naturally, this meant a considerable amount of time passed before they managed to get pregnant. 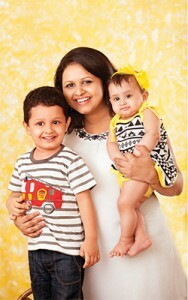 Durba admits, “We spent close to five years trying to have a baby. Rabin and I even considered adoption if our efforts didn’t prove successful.” However, their prayers were answered and Durba soon found out she was pregnant. The couple did consult a number of fertility experts and doctors, just to ascertain that nothing was physically or medically wrong with them. 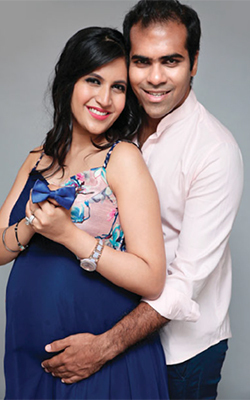 During one of their visits, the couple found out that Durba had the initial signs of PCOS, but they were assured it wouldn’t affect the pregnancy. Problems would arise only because of a stressful lifestyle. However, none of that mattered when the couple found out they were expecting. “In one of the home-pregnancy tests I took one day, I couldn’t believe it when the strip turned pink. Rabin had gone for his morning walk when I called out to him in excitement. He immediately rushed back thinking there was an emergency. But after hearing the good news, I saw just how excited he was,” says Durba, with the same glow as she recalled that moment. Rabin’s parents were elated when they were given the good news, while the rest of their family couldn’t wait to welcome their newest member. However, all was not hunky-dory. All the initial excitement slowly started fading when the pregnancy blues began settling in. The first trimester is usually the hardest, and for Durba, that proved true. “I did not have an easy pregnancy. I was bleeding profusely in the first trimester and the doctors could not detect a particular reason for it. 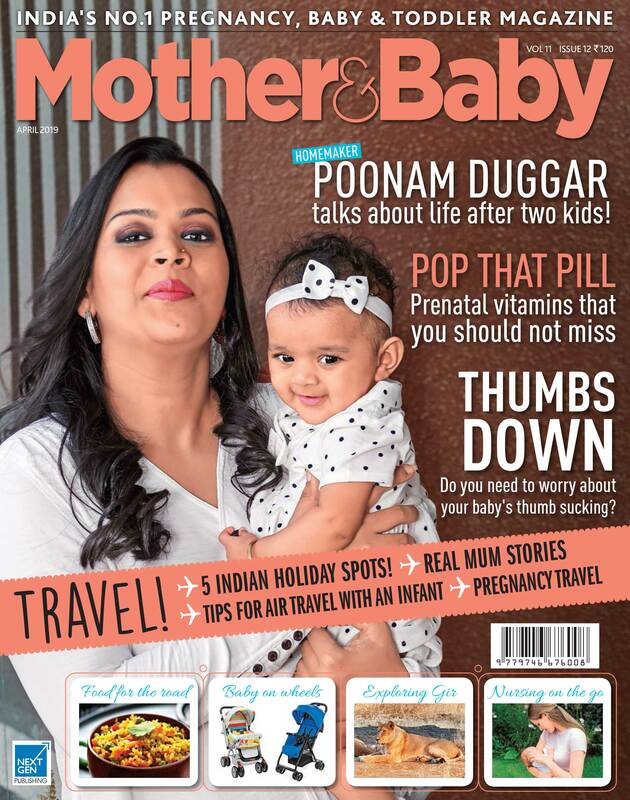 Because of the lack of answers, I was prescribed complete bed rest and I even had to take Gestone, progesterone injections, on a daily basis for the next three months, to help maintain my pregnancy,” says Durba. The bleeding eventually ceased and Durba was able to resume work, which she continued till it was time to have Aurko. However, her pregnancy-related problems didn’t stop at bleeding. Durba also developed rashes on her body. According to research, rashes occur in a few cases, when the body identifies the growing foetus as a foreign object. If that’s not all, Durba also suffered from gestational diabetes. “Due to several gastric attacks, I would throw up a number of times in matter of hours. On such occasions I would become too weak to move. But, with time, this also passed,” says Durba, recalling her pregnancy. It was then that Durba found solace in her doctors Dr Duru Shah and Dr Sabah from Gynaecworld, Kemps Corner. “Contrary to what you read or see in the movies, I didn’t have any urge for a particular kind of food, least of all anything sour. I relied on home-cooked nutritious meals and kept a thorough check on my diet,” she says. She relied on the BabyCentre pregnancy app for additional advice and is thankful for the exhaustive information it provided her. During her difficult pregnancy, the couple didn’t give up, and eventually, everything worked out well for them. Before D-Day arrived, Durba was showered with blessings from near and dear ones. She received not one, but three baby showers. “It was a delight to watch everyone so excited for the baby to arrive. My fi rst baby shower thrown by our friends was a fun pirate-themed party where our friends’ kids blessed the baby. The second one was a traditional Bengali ritual and many of our family members attended the function. The third one was organised by Rabin’s cousin. 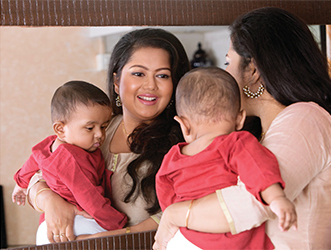 I felt special and was happy to see that the baby received so many blessings,” reminisces Durba. 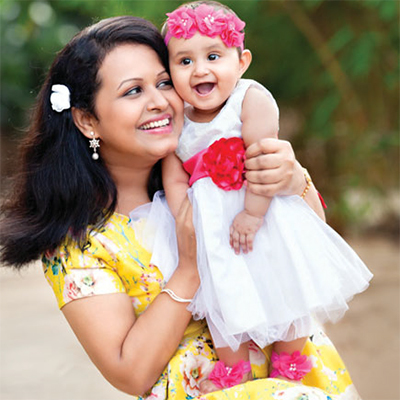 It was during her 37th week of pregnancy that Durba was wheeled into the Operation Theatre for an elective C-section. The doctors explained that due to her gestational diabetes, if they waited to have Aurko at full-term, his weight would increase, and that could lead to complications. Fortunately, Durba didn’t have a prolonged labour, and within half and hour, she gave birth to a healthy baby boy. However, the baby was diagnosed with low blood sugar as a result of the medicines Durba had taken during her pregnancy and hence was kept under observation in the NICU for a day. “Rabin paid a visit to the NICU every few hours and he would come back teary-eyed. Seeing the babies fitted with drips broke his heart, but it made us incredibly grateful for a healthy child,” says Durba, with immense gratitude. After bringing their baby home from the hospital, they settled on the name Aurko, which means Sun. “It was surprising but my husband was a little disappointed when I gave birth to a boy. He was confident that it would be a girl, and for that reason, we never discussed any boy names. We’d always argue over names for a girl,” Durba grins.